The objective of the course is to enable a student to acquire the knowledge pertaining to fundamentals of Information Technology (IT Tools and Business Systems, Internet Technology and Web design, Programming and Problem Solving through ‘C’ Language, Application of .NET Technology, Introduction to Multimedia, Introduction to ICT Resources, a Practical and Project Work). 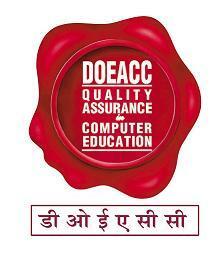 In order to serve the IT industry better, the DOEACC ‘O’ Level course has been designed to develop the basic skills for the above. PJ Project Duration of the Course Minimum duration of the ‘O’ Level course is One Year.